Ahhhh oui my dears, love is in the air. Hearts and lips are floating around your face and shop windows are plastered in hues of pinks and reds. Even restaurants have heart shaped foods today. I actually made my fox some heart shaped blackberry pancakes this morning. 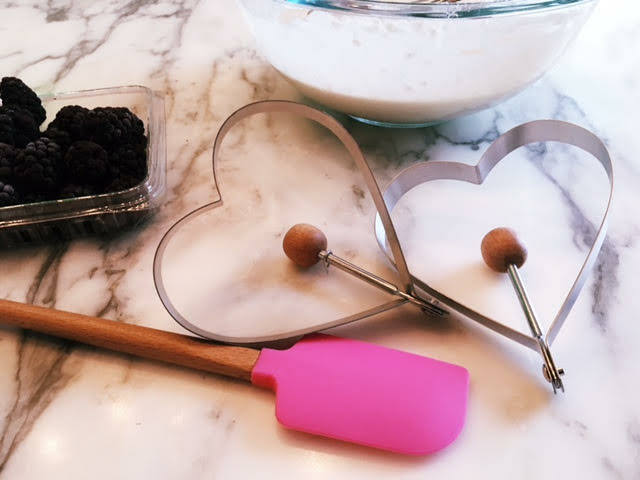 I could not resist these Kate Spade heart shaped molds I found. You can see more of our funny morning together over on insta stories. It'a a dark rainy winter day here in Tulsa (my fave weather) and I am definitely feeling romantic. My love, Ryan Adams dropped a surprise First Listen on NPR this morning. The new album comes out later this week so it was the best V-day present I could ever ask for. And I spent the day finalizing all the last minute details for my LALALAND themed birthday party and isn't the decor up there just perfect? I cannot thank Fox Fete enough and am so excited for you all to see the final touches here on the blog after the party. Rodge gifted me the LaLa Land soundtrack on vinyl so that's been on repeat too. While this image is so lovely, the typical Valentine’s Day gushiness can come across as a bit annoying at times, especially to the single folks out there. And although some may be spending the day bathing in this holiday’s cheesy romance (turn up that Marvin Gaye and get out the best lingerie you have), I thought I would gift all of my readers with some good music. I will also be sharing a list of romantic comedies that were sent over to me in a face-book post today. All about sharing the love! Here’s a playlist with a little something for everyone — even those who hate Cupid’s favorite day. Seriously something for EVERYONE. Lin even made me throw a Frank Zappa track on here. HA! I personally love Eternal Sunshine of the Spotless Mind . But I may be flying solo here! Amanda Frausto: PS I Love You! So loves...it is time for me to enjoy some chocolate covered strawberries and sangria (it's my new thing) in a hot bath that my sweetie has prepared!